Although Chael Sonnen (Pictured) was halfway across the globe serving as a panelist for FUEL TV in Los Angeles, he quickly became the hottest name in Brazil on Saturday night. After Vitor Belfort beat Michael Bisping in jiu jitsu country, Belfort insulted “that clown” Sonnen while begging UFC management to allow him to take Uncle Chael’s place against light heavyweight king Jon Jones. The only problem is, Belfort just posted a win at middleweight. 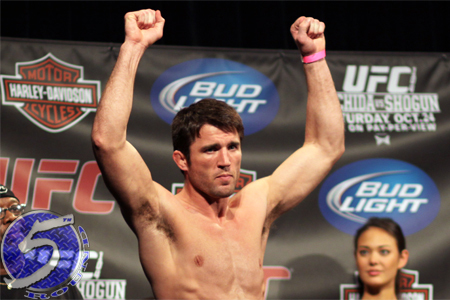 So according to Sonnen, he has no right to ask for a 205-pound title tilt. Ironically, Sonnen is fresh off a loss to middleweight king Anderson Silva and hasn’t competed at light heavyweight in nearly seven years, yet here he is about to challenge Jones for his crown. While Belfort didn’t request a tango with Sonnen, he sure issued some fightin’ words. And if that’s the case, Chael P. is more than willing to oblige. “Let me be really clear and speak directly to you, Vitor. You’ve been telling the world that you want to meet Jesus, I will gladly arrange that travel,” Sonnen added. “But first, I’m gonna get rid of Jon Jones, but you are next. When the cameras turned off, Sonnen took to his Twitter to throw one last jab at the one-time testosterone abuser. “@vitorbelfort – Do you have a BYO urine clause in your contract?” he posted. Sonnen meets Jones at UFC 159. If he comes up short on April 29th, as the Gambling Gods and every MMA pundit expects, the organization won’t have to look far for Sonnen’s next opponent.